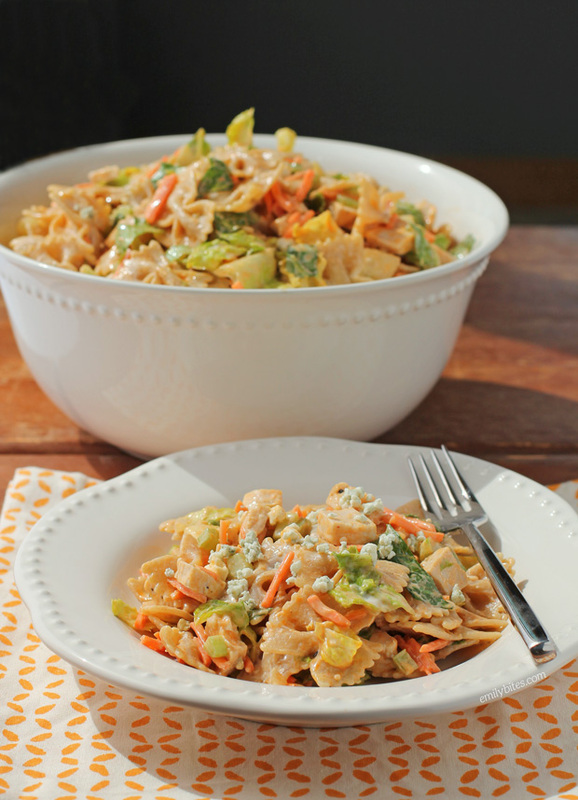 This Buffalo Chicken Pasta Salad is a fun, creamy, spicy twist on traditional pasta salad that makes a great main dish for lunch or dinner as well a crowd-pleasing potluck option. I liked the idea of lightening it up a bit by making it part pasta salad, part green salad using the Romaine and it turned out amazing. 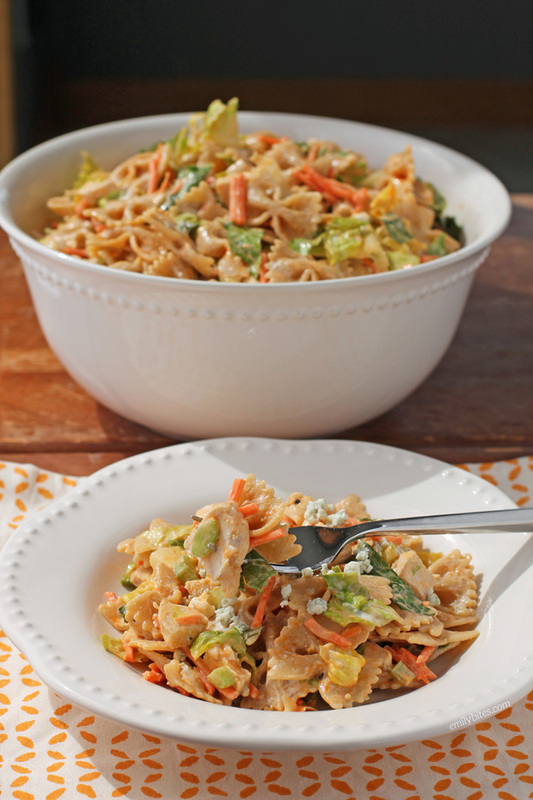 The romaine, celery and carrots give crunch, it’s super hearty and filling with the chicken, veggies and pasta, and the sauce is creamy with a nice little Buffalo kick. If you want to make less, it’s easy to halve the recipe, and I especially love it as a portable weekday lunch option. If you do want to serve it as a side dish at a cookout or potluck, I would just cut the serving size in half for 16 servings of 2/3 cup each. Don’t forget to check out my Easy Slow Cooker Shredded Chicken post- the perfect way to make shredded chicken for this recipe! Love Buffalo chicken dishes as much as I do? Check out the Buffalo flavor category of my recipe index for Buffalo Chicken Enchiladas, Slow Cooker Buffalo Chicken, Buffalo Chicken Lasagna Roll-Ups, Buffalo Chicken Pizza, Buffalo Chicken Quinoa Bake, Buffalo Wing Hummus, Buffalo Chicken Taquitos, Buffalo Chicken Wonton Cupcakes, Buffalo Cheese Bread and more! Cook the pasta in salted water according to package directions and drain. Allow the pasta to cool and then place it in a container in the refrigerator for at least an hour until chilled. When the pasta is cool, place it in a mixing or serving bowl and add the chicken, lettuce*, celery and carrots and stir together until well combined. In a separate bowl, combine the crumbled blue cheese, Greek yogurt and blue cheese dressing. Using a fork or the back of a spoon, “smush” the blue cheese crumbles into the yogurt mixture until there are no large chunks remaining. Add the Buffalo sauce and stir until well combined. Pour the blue cheese mixture over the pasta salad and toss together until pasta salad is well coated. *If you are planning to make this once and eat it for lunches all week, I would suggest waiting to add the lettuce and just adding it in to each serving when you pack your lunch to ensure it doesn’t wilt. It’s against everything I am as a Buffalonian to suggest this, but…I *guess* you can use ranch if you must ;). Enjoy! This looks really good, definitely going to try it, but without the lettuce, not really sure why lettuce is in a pasta salad. Hi Mary Beth, Buffalo wing sauce is usually found by the hot sauce. Frank’s Red Hot makes one, but if you can’t find it you can use their regular hot sauce. Can’t wait to try this!! I love a good pasta salad. Occasionally I make a salad with pasta, so it should be tasty! I am going to make this for lunches this week and add the lettuce everyday as I go so it doesn’t get too soggy. This sounds great, thanks! Great idea, hope you love it! Made this tonight for Fear the Walking Dead and it was a big hit. Can’t wait to have the leftovers this week for lunch. How do we measure the servings if we are putting the lettuce in each day for lunch? Would it be 1 cup pasta mixture then 1/3 cup lettece?? Or 1 and 1/3 cup pasta mixture then add lettuce? Please advice :). Thanks!! I have the same question about how much pasta and how much lettuce to use if you are adding the lettuce separately? looking forward to having this for lunch tomorrow! Just make it without the lettuce and then you can either weigh the whole recipe or count it out in cups. Divide by the number of servings listed and that’s the right amount. Then you can add in as much lettuce as you prefer when you take a serving! Thank you so much for this recipe! It was delicious, better even than I was expecting. I added a touch more buffalo sauce and used rotini for the noodles, but kept everything otherwise the same. I’m going to be trying many more of your recipes in the future! This is my first time here and I love how detailed your recipes are!!! Keep up the good work!!! This receipe looks great. i normally meal prep on a Sunday ( for lunches up till Wednesday) and again on Wednesday for the rest of the working week. Does the pasta salad keep well in the fridge and taste okay a couple of days after? Have the smart points changed on this since you posted the recipe. It’s coming up as 4 smart points on the weight watchers recipe builder . Oh never mind I put the Incorrect ounce of dry pasta oops lol . Emily is just giving her version of a recipe…why cant you try something different or alter it yourself instead of making all the negative remarks? ?